Makumba Community School pupils were very happy to receive desks donated by Academic work of Sweden. 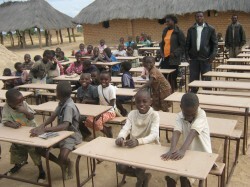 Before the receipt of desks the pupils use to sit on bricks or logs and used their laps when writing. With the comfort of the desks, the pupils will learn happily and look forward to go to school each day without thinking of who has sat on their log if they are late. I am a regular reader of your blog. I really admire your writings. Subscribed for your RSS feed.